NAGATA Atsumasa March 20, 2011 Nakanishiya Shuppan, 224p. He was born in 1974. He is currently a research instruction assistant of the Graduate School of Core Ethics and Frontier Sciences at Ritsumeikan University. He is also a part-time lecturer at various institutions including Kobe City University of Foreign Studies. His research themes cover transnational anthropology, sociology, and migration studies. He graduated from the Faculty of Law of Kyoto Gakuen University in March 1997. He then received his PhD at the Graduate School of Core Ethics and Frontier Sciences of Ritsumeikan University in March 2008. He also received Research Fellowship for Young Scientists of Japan Society for the Promotion of Science, which is targeted for doctoral students, from April 2007 to March 2008, and for post-doctoral fellow from April 2008 to March 2009 (Office of Sociology at Kyoto University). 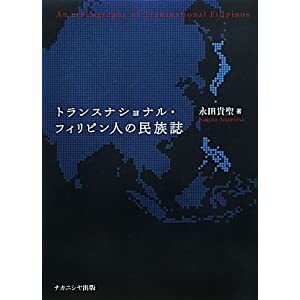 His main publication includes: "The Filipino who Become Transnational between Japan and the Philippines" Ars Vivendi 2:192-206 (2010); "Filipinos Cross the Border Line: Between the Transnational Practice and State Power" Gendai Shiso 35-7 (Special Issue: Neighbor Foreigners) (2007) ; and an essay "Living as a Foreigner: A Family Connecting the 'Philippines' and 'Japan'" Monthly Minpaku vol.30-7 (2006).